Peel, core and dice the apples. This should yield about 2 cups of diced apple. Preheat oven to 400 degrees F. Grease twelve regular (2 1/2" by 1 1/4") muffin cups or line with muffin papers. In large bowl, mix first 5 ingredients. In small bowl, with wire whisk or fork, whisk together the buttermilk, butter, oil, vanilla and egg until well blended; stir into flour mixture just until flour is moistened (batter will be lumpy). Fold in apples and walnuts. In cup, mix sugar and cinnamon. Spoon batter into muffin cups; sprinkle with cinnamon sugar. 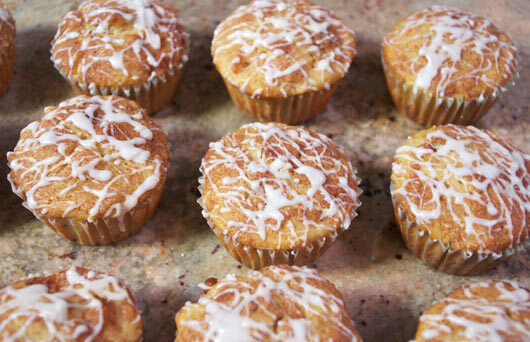 Bake muffins 25 minutes or until toothpick inserted in center of a muffin comes out clean. Immediately remove from pan; serve warm. Or cool on wire rack; reheat if desired. Each tasty muffin has about 185 calories, 5 grams total fat and 1 gram saturated fat. If you don't have buttermilk, you can use regular milk. Just use the same amount of milk and replace the teaspoon of baking soda with an additional teaspoon of baking powder. To make a vanilla icing drizzle, take 1 cup of powdered sugar and and a teaspoon of vanilla and stir in milk 1 Tablespoon at a time until the consistency becomes barely fluid. Then, drizzle it randomly over the muffins with a small spoon. 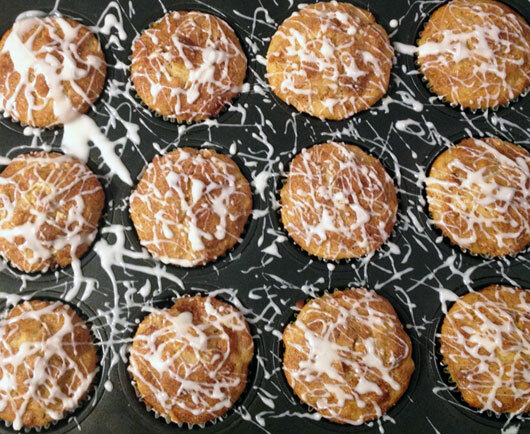 Moist buttermilk muffins with noticeable apple in every bite. Drizzle with vanilla icing to make them pretty. Mr Breakfast would like to thank CrisiMarie for this recipe. Recipe number 668. Submitted 9/19/2002.